Free shipping Black Friday through Cyber Monday! To all my American readers, have a wonderful Thanksgiving! When I first began making my own bags my fabric choices were based on my own taste. I liked flowery fabrics and green. LOL! I knew I was going to have to expand those tastes if I was going to make bags that other people would want to buy. So I forced myself to look beyond flowers and green. Little by little I picked fabrics I would never have considered for myself. Someone pointed me to Day of the Dead and now those prints are a solid part of my line. 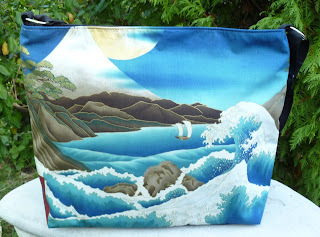 I was shown the Asian style prints and now they are one of my favorites, and I have many customers who love them too. My tastes have become eclectic. I can't say I love everything I buy, but, I work hard to find prints I think my return customers will like. Plus I offer such a wide range of fabrics, and colors, that I am sure most people will find at least one, or two, that they love. These three Britta Shopper Totes illustrate a bit of that range. I am really drawn to quirky prints these days, and this Knitmare on Elm Street Britta, sure fits the bill. The look on the kid's face, and the book the skeleton is holding, "quick and easy knitting projects" crack me up! In Aztec mythology, Iztaccíhuatl was a princess who fell in love with Popocatépetl, one of her father's warriors. The emperor sent Popocatépetl to war in Oaxaca, promising him Iztaccíhuatl as his wife when he would return (which Iztaccíhuatl's father presumed he would not). Iztaccíhuatl was falsely told Popocatépetl had died in battle, and believing the news, she died of grief. When Popocatépetl returned to find his love dead, he took her body to a spot outside Tenochtitlan and kneeled by her grave. The gods covered them with snow and changed them into mountains. Iztaccíhuatl's mountain is called "White Woman" (from the nahuatl iztac "white" and cihuatl "woman") because it resembles a woman sleeping on her back, and is often covered with snow. (The peak is sometimes nicknamed La Mujer Dormida ("The Sleeping Woman").) He became the volcano Popocatépetl, raining fire on Earth in blind rage at the loss of his beloved. And finally, I think I gasped out loud when I found this print. Waves are often found in Japanese prints, and this one, is especially gorgeous. This bag sold before I could even put it into the shop. No wonder, it's stunning. Expect to see more Brittas in this print, in the green colorway here, and a deeper blue as well. Google+ now allows businesses to have pages like Facebook. Click here to find me there . If you are a fan of Google+ I hope you'll stop by and say hello! The Day of the Dead, or Dia le los Muertos, takes place on November 1st and 2nd. It is celebrated around the world, but in Mexico it is a national holiday. I am fascinated by this celebration. It is so colorful, and, while it is honoring those departed, it has a sense of joy that is contagious. The fabrics that are made to honor the day are brightly colored and full of life, even though the motifs are skulls or skeletons! The fabric with the sugar skulls is one of my most popular, and I sell bags made with it year round. Here's a purse made with Fiesta de los Muertos. see what I mean? They are having a great time! You can find the Day of the Dead themed bags in my shop here. As always custom orders are encouraged.